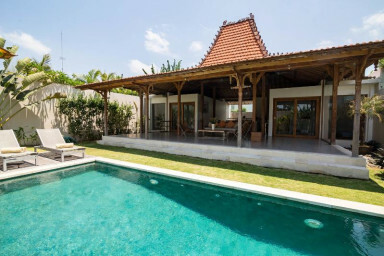 Tastefully decorated in Joglo style mix design, Villa Wiro is a two bedrooms Villa located in the quiet neighborhood of Canggu Area. Only a few minutes from Berawa Beach and surfing points, Villa Wiro offers plenty of comfort and privacy with an open-air concept living. If you have any special requests for a snack or special Balinese food, the Villa staff will be happy to help you purchase it at local market prices.